Somebody over at The Weather Channel offices spent quite a bit of time working on an update for their Android application. It was pushed to Google Play this morning and brings a whole new look and feel to the app. So new in fact that they greet you with a informative splash page as soon as you open the app, listing out all of the new features. While I didn’t have time to go looking through their video galleries or checking my local weather radar, I did have time to appreciate the smooth gesture-based UI, and all of the neat Toyota advertising placed throughout the app. All in all, this weather app might find itself sitting on my device for a little bit. “Expect rain to start at 3:15p”—No more guessing! If your weather is changing within 6 hrs, we let you the exact time it will happen. 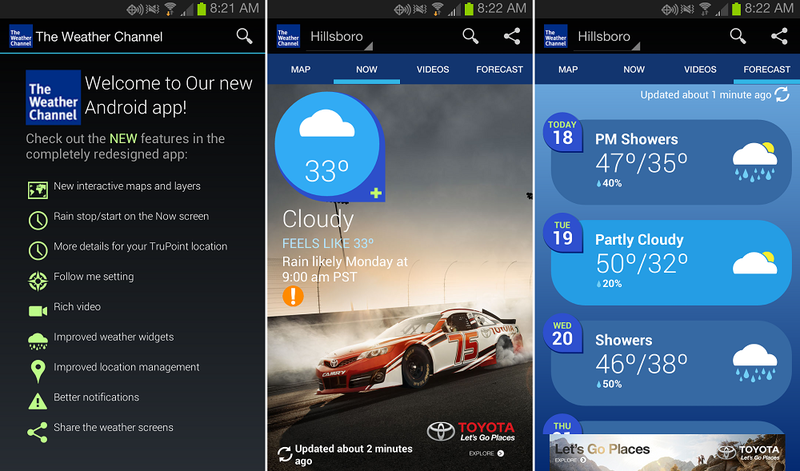 Set up your favorites places to take full advantage of our weather widgets and notifications. What everyone has been asking for, a Refresh button!